Adobe Reader and Microsoft Word have different methods for displaying text within their files. Font sizes have much finer granularity in Acrobat then in Word for example. Solid Converter PDF and Solid PDF Tools have to make choices when converting PDF text into Word text so that the document formatting and layout are maintained. This might mean adjusting the character spacing to help make it “fit” in Word. 2. Choose Format Font Character Spacing and select 100%. Newest version enhances conversion and reconstruction features; Gives developers power to build applications for the creation, modification and conversion of PDF files within 64-bit native environment. 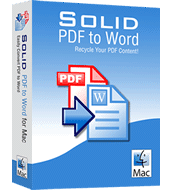 We’re so excited about the new release of Solid PDF to Word for Mac that we are giving the first 500 people a 25% discount to download and purchase Solid PDF to Word for Mac. Thanks for the overwhelming response! Note, as of May 3rd, this special offer has ended. But don’t take our word for it. Listen to what others have to say…. and download your copy today! Stephen Withers from ITWire: Solid PDF to Word - a better PDF converter? 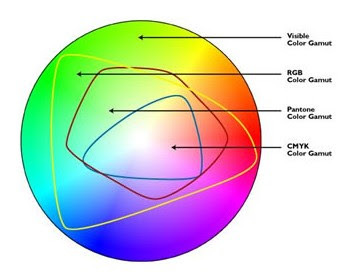 "I read about this product at an online Mac news site. After downloading and trying the demo, I was amazed at the accuracy and speed of conversion. It took me just a moment to go back to your site and buy a license. The 25% early special was icing on the cake. It will no doubt be an application I use often and your software will become an important part of my workflow in graphic design. Great work!" "Wow! I took a PowerPoint file made on a Windows PC converted it to PowerPoint on the Mac then converted it to a PDF for my iPad and then took that PDF and converted it to a Word file for my Mac. Flawless conversion!!! This really helps with getting files on your iPad that you can edit. Bravo!" Should PDF converters respect PDF security? Solid Documents says yes. Adobe PDF Reference states that anyone is free to use the PDF standard as long as they abide by PDF security settings. Solid PDF to Word for Mac respects all PDF security settings as do all Solid Documents products. 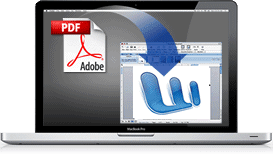 Does Apple OS X provide a method for converting PDF files into other formats? Sort of. You can write an automator application to convert PDF files into RTF documents but you can only extract the text. No formatting is preserved, no tables and no images. If you just need text then the automator application can deliver text. Some of the time. In our experience the automator application can only handle very simple PDF files. It closes with unexpected errors when offered PDF files with non-standard encoding (very common issue with PDF files), it creates 0 byte files for other PDFs that it cannot convert and generally didnʼt perform robustly to provide useful results. It's here... Now re-purposing and reusing documents becomes quicker and easier for Mac users. Easily convert PDF to Microsoft Word, Excel, and more with Solid PDF to Word for Mac. Windows users have been using our award-winning PDF to Word conversion utility for years. Now anyone, regardless of platform, can easily convert PDF files into other editable content. Solid PDF to Word for Mac converts PDF files into Microsoft® Word (.docx), iWork Pages (.pages), Rich Text Format (.rtf), or plain text files (.txt). Extract data to Excel (.xlsx and .csv). Reflow documents into continuous HTML (.htm) format. Be one of the first to download and purchase Solid PDF to Word for Mac. We're offering the first 500 people a 25% discount (normally $79.95, limited number for $59.95). Thanks for the overwhelming response! Note, as of May 3rd, this special offer has ended. 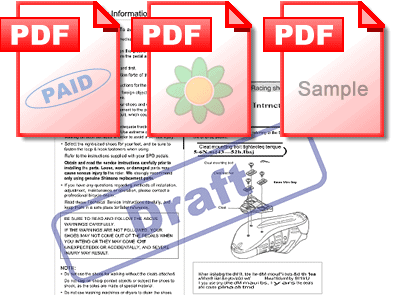 Watermarks communicate context when applied to your PDF documents. Using them can help prevent unwanted distribution or miscommunication between you and your colleagues, or you and your clients. When you are referring to the size of your hard drive or the dollar amount of your annual bonus, then bigger probably is better, but if you are trying to save space on that hard drive or e-mail a family newsletter with pictures of all the new toys you just bought with your gigantic pay-check, then you probably want to be able to keep the size of your electronic files on the small side. Solid PDF Tools allows you to create and apply a searchable text layer to your scanned documents using OCR (Optical Character Recognition). This OCR layer makes your PDF documents easy to index and archive so that you can quickly find what you need, when you need it.